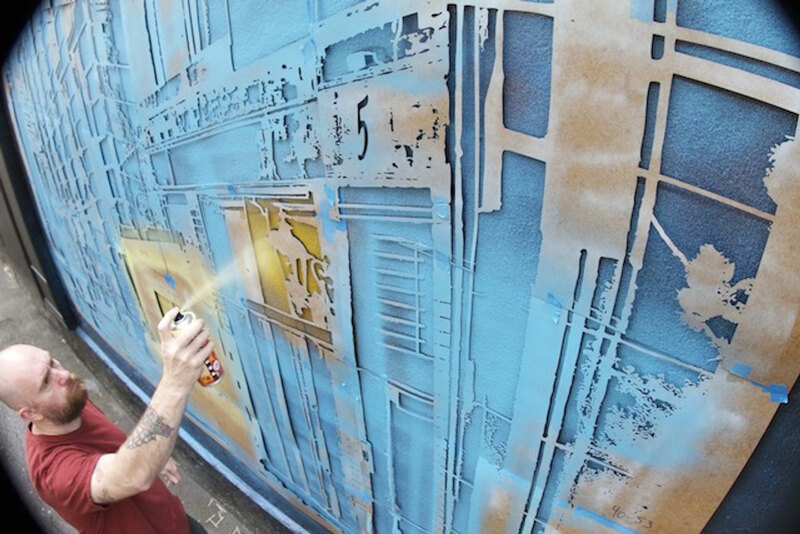 Hicks uses multiple stencils and often several fine mists of color spray on each stencil. The nightscape Logan masterfully created for the Wynwood Walls has multiple layers and is more intricate than other work he has done. Logan Hicks is a prolific stencil artist who calls New York home. His large scale murals are of gritty urban scenes, but layered with glowing, pulsing colors that make them look like living organisms. The eerie photorealistic quality makes film noir of them, with secrets hiding under every rain slicked street lamp. The Brooklyn-based artist had been creating murals in the Wynwood district since 2006 for Primary Flight, an initiative that shared a similar artistic concept in its placement of outdoor murals around the neighborhood for everyone to enjoy. Logan’s chance to contribute to the newly created Wynwood Walls in 2009 was timely as it marked the beginning of a new direction and body of work for him. Unlike color block muralists like Shepard Fairey, Hicks uses multiple stencils and often several fine mists of color spray on each stencil. Any stencil he creates is based on a photo that he’s taken, and for the Wynwood mural called “Lemon Vodka and Churros” Logan was inspired by his experience of wandering around the city between one and four o’clock in the morning taking hundreds of photos ”that peaceful quiet time that’s so rare in a city like New York.” It’s also a love story. 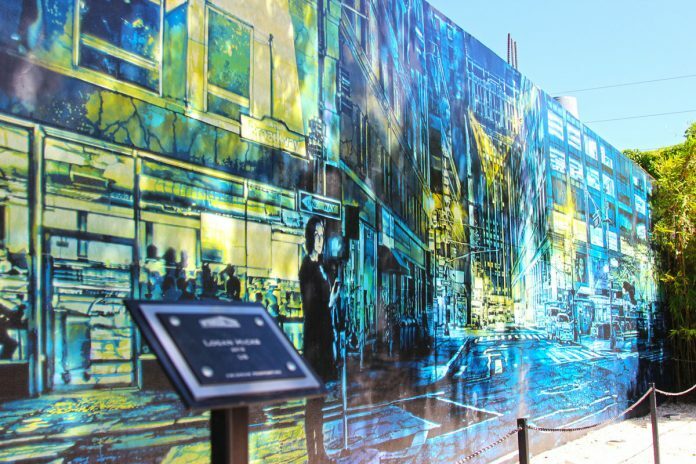 The nightscape Logan masterfully created for the Wynwood Walls has multiple layers and is more intricate than other work he has done. All the stencils made for the 40- by 7-foot wall needed to be cut in advance, and during the intense production, Logan remembers having new stencils sent overnight from his studio in New York just as he was finishing one of the seven layers that finally comprised the piece. Hicks also has a large piece for Goldman Global Arts at Hard Rock Stadium, it’s an interesting take on an architectural work in an unusual architectural setting. The mural arches over a huge doorway. Hicks has more projects lined up. He has begun working with the Open Space Gallery in Paris, as well as the Wanrooij gallery in Amsterdam. He will continue to focus on that in the future, as well as the Taglialatella Gallery in NY and Station 16 in Montreal. Aside from that though he has two murals that will be completed before the end of the year. One at Asbury Park that was organized by the Parlor Gallery and one gallery in the Lower East Side at a location that I can’t divulge just yet. Brooklyn-based artist, Logan Hicks, has been creating murals in the Wynwood district since 2006. His mural at Wynwood Walls in 2009 marked a new direction.